Frozen meatballs are one of the best shortcuts out there and I love to toss a bag in my slow cooker with some sauce ingredients for a quick supper that doubles as a snack throughout the day. This recipe is one my husband and I particularly enjoy because we have enough left over for a few lunches throughout the week. 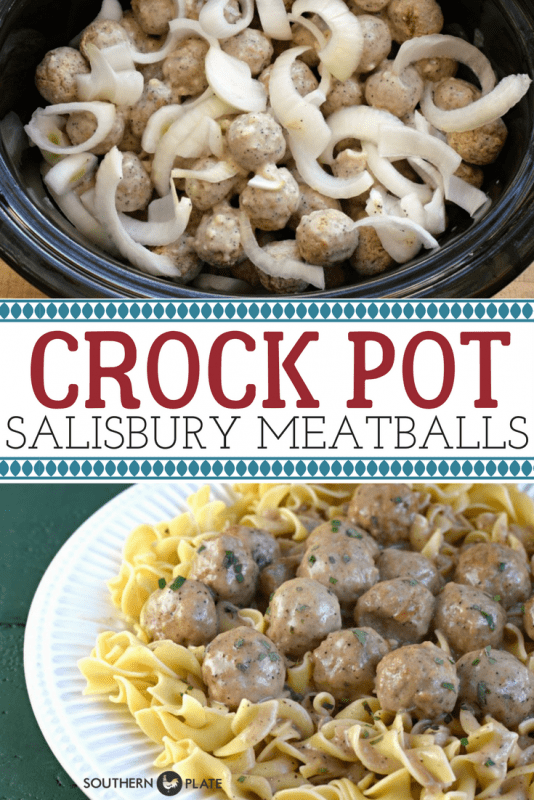 If you don’t need as many, just use a small bag of meatballs, but leftovers freeze well, too! You’ll need: Black pepper (this is essential, in my opinion), milk, cream of mushroom soup*(2 cans for the whole bag, one for half of the bag or a smaller bag), a bag of fully cooked all beef or turkey meatballs, onion, and some Worcestershire sauce, which is as essential as the black pepper in my mind! Using the recipe below, stir together the cream soup, milk, black pepper, and Worcestershire sauce. Place meatballs in a 4-6 quart slow cooker. Pour sauce over all and top with onions. Cook on low, 7-8 hours or high, 3-4, stirring at least once to help the onions cook. Serve over freshly cooked egg noodles and enjoy this simple satisfying meal! In small bowl, stir together the cream soup, milk, black pepper, and Worcestershire sauce. 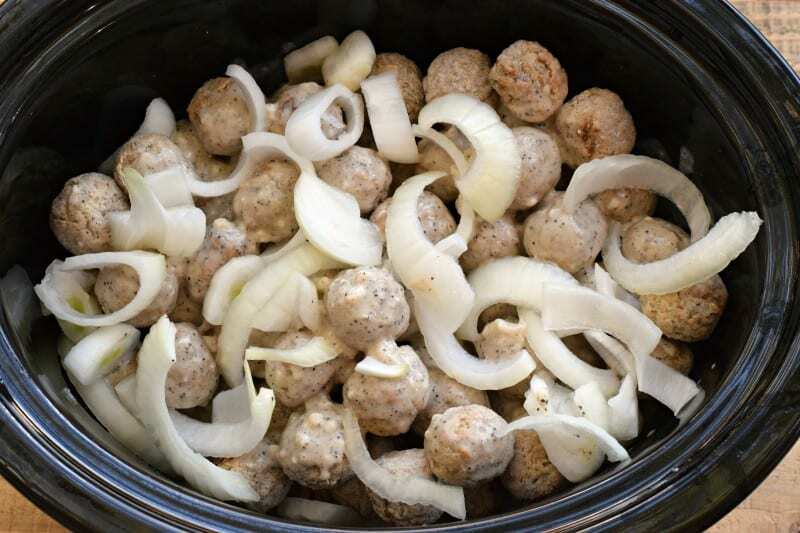 Place meatballs in a 4-6 quart slow cooker. Pour sauce over all and top with onions. Cook on low, 7-8 hours or high, 3-4, stirring at least once to help the onions cook. *I use the higher amount of black pepper but suggest you start on the lower end and adjust to your taste. 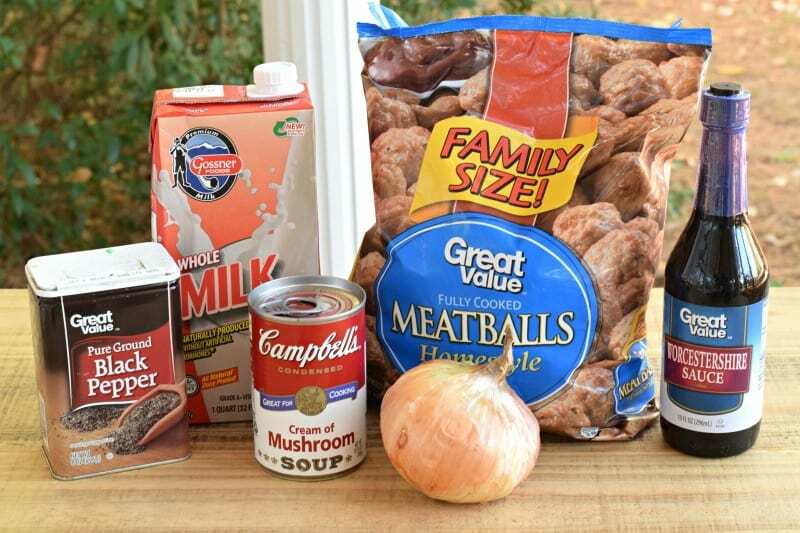 **If making a smaller amount, use one can of soup but leave all other ingredients the same. This post is featured on Meal Plan Monday and Weekend Potluck. Thank goodness there is still someone else using the good old Campbell’s canned soups. I feel better already. Thanks, Christy! Sounds delicious! I’m gonna try this soon! This looks great, Christy!! I think I also see some chopped chives or parsley? About how much? Oh this is sure to be a winner! Sounds yummy! I went and got the worstechire and meatballs. I had everything else. This is,dinner tonight!!! Thank you, Robert! It’s always a treat to get to see you! Hope you enjoy it! Hey Kathy! That group doesn’t take the place of my website, but I have moved a lot of the posts like that from my main Facebook Fan page to there. So in short, nothing has moved from here to there, just some things from one facebook location to another facebook location :). Here, you’ll find a lot of that in the navigation at the top right of this page where it says “Scripture writing”, “Christy’s Corner”, etc. I try to also include links to that stuff in my emails as well. Thank you for being here! Oh. My. Goodness. You used FROZEN MEATBALLS in this?!?! I’m OK with cream soups, but FROZEN MEATBALLS… from the devil, I’m telling you. : ) Hahahaha!! I love it that you deal with these issues right off the bat! I have to shake my head over where we are these days. I’m not gonna stand before the judgement throne and pat myself on the back over saving the world from… canned cream soups. Great looking meatballs! Looks perfect for a Sunday dinner! Thanks! I just love you Becky!!! I would like to have the homemade meatballs. recipe? and then put them into the slow cooker and use your recipe for the sauce. thank you. Hi Christy,This sounds good and easy.Think I’ll make this.I am glad you deal with issues right off the bat,that’s the way you have to be some times.I don’t do facebook,yet I always enjoy your emails.I copied your interview with AL.com mainly to share with people,also because I liked what you said.Thank-you for all you do. Thank you so much Doris, that just made my day!!! I am so glad I found your site! I feel blessed on each “visit”. I enjoy reading ALL of the posts, and hope you will continue writing uplifting stories, and of course, I love the recipes, which often take me back in time, and are usually simple and delicious… I hope it does not change too much, as I do not “do” Facebook either. BTW, I have all 3 cookbooks, and they are wonderful! I just received “Sweetness” today, and have hardly been able to put it down! Thank you. Oh my goodness, thank you so much Carol!!! 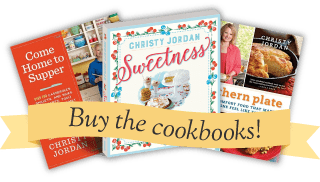 I am so glad you are here, are enjoying the site and the cookbooks!!! LOL, you crack me up. I have these handy ingredients already and will probably be making this Sunday night for Ed’s supper after work. It comes in handy to have it in the crockpot for when he gets home around midnight! I love canned cream of mushroom soup/cream of asparagus/cream of celery but I make my own cream of chicken for some reason. I hope y’all like it!! Can’t wait to hear! We love it! The family down SC love it too! I even whip it up quickly on the stove-top……my son-in-law doesn’t eat stuff cooked in the crockpot (LOL) whatever. This is great served low carbish over Cauliflower rice or Zucchini ribbons. Great idea Barbara!! I am so glad to hear your family likes it!! I wish there was a way, too. The fellowship group is my primary motivation for being on Facebook and some have created accounts just to be a part so that is always an option. I’ll still be here though. You aren’t seeing much of my rambling because of how busy I am with the holidays and book tour but once that dies down I’ll likely be writing more personal stuff here. 🙂 thanks for being here! This sounds good! I see absolutely nothing wrong with using canned cream soups–why re-invent the wheel? I’ll have to get the ingredients on my next trip to the grocery store. I like the way you think Beverly!! Dear Christy: I have never used frozen meatballs, but I don’t think they are of the devil, either. I don’t get them because they usually contain things I can’t have. I freeze my own meatballs and sausage and it works very well. I usually do sausage meatballs, and whether I’m doing those, or the Turkey Breakfast Sausage, I cook them on a rack with tinfoil under them over a half-sheet. They all fit nicely, there’s less mess and clean up, and the meatballs, I package in threes. I can use them in pasta, for a meatball sandwich, or whatever, and I also have frozen uncooked biscuits in the freezer for the sausage patties. Note: I don’t have a Smartphone, or a tablet, and I LIKE the pictures, and the stories, and the ramblings, and I am not on Facebook, either. I bought the Kindle ed. of “Facebook for Seniors” quite some time ago, and haven’t touched it. Maybe someday. I’m looking forward to the new book arriving Monday night on my Kindle. I am reading the third book in Melanie Dickerson’s “Fairy Tale Romance Collection.” These are retellings of favorite fairy tales such as “Beauty and the Beast” from a Christian standpoint, so they are clean reading. I am enjoying them a lot. There are five in all. She’s a very good writer and the editing/proofreading is a joy. I was into the third book before I found a small typo. That is quite refreshing nowadays, and rare. I am so tired of serving as an unpaid editor/proofreader and interrupting the flow of my reading to send in corrections. Anyway, I can highly recommend these books to you. You need to use the kindle, go to amazon.com there are tons of free books in all types. I like the cozy mysteries. I pinned it. Can’t wait to make it. Only thing is, I couldn’t decide which board to put it on, slow cooking, one pot wonders, where’s the beef, snackies (I can see a crockpot of this right next to the BBQ weenies on football day), or use it to start a low-carb board. I hope you get the chance to try it soon Blanche!! Loved this recipe. So easy and delicious. We added mushrooms and served over rice. Family loved it. Christy, thank you for blessing our family with not only wholesome recipes but wonderful encouragement. God bless you. May He bless you as well Debbie!! I am so glad you liked the recipe!! How about Cream of Onion? Just use whatever ‘Cream of…’ that you like! 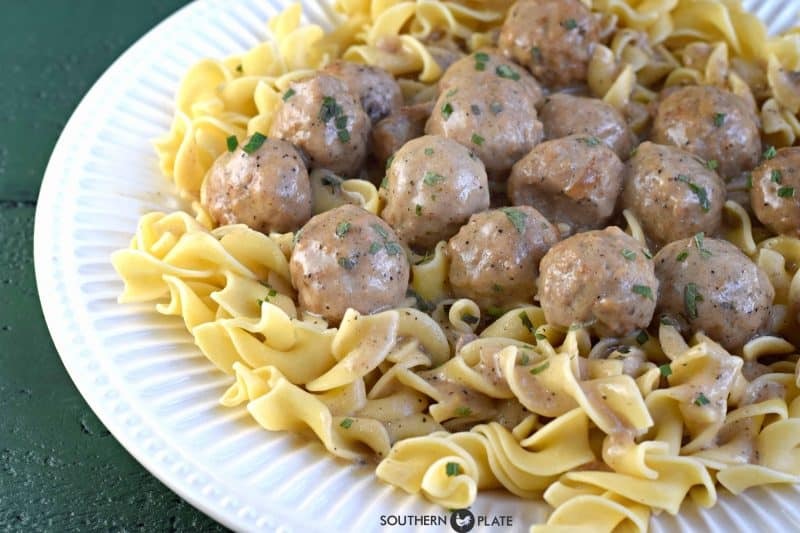 Yum, adding the meatballs to my grocery list-so glad you shared this recipe-this will be Sunday dinner for us. I hope you enjoyed it Kathi!! Could you serve this over rice? I’m thinking a little sour cream stirred in at the end would send this over the top! Thanks for the recipe! Thank you Christy for solving some more of the worlds problems and making me LOL at the same time. I was looking for something for tomorrow to put in the slow cooker and this fits the bill – trying to do a freezer/pantry cleanout/up this month and next. Have a todo list for tomorrow and needed something to feed the troops and not keep me tied to the kitchen-will make a salad to go with it and done. 🙂 Glad to help. I hope you enjoy the day as well as the meal!! Minced celery, I usually have a container of diced onuon, celery & that I zap in broth and buzz with an immersion blender. If I’m feeling really decedent, I have IKEA Swedish Meatball gravy envelopes in the pantry. I add plain Greek yogurt. I haven’t forgiven Ikea for mashed potatoes. I prefer the meatballs with steamed baby potatoes. Edith… This sounds excellent, too. I love IKEA. Will definitely have to try your adaptation. made this today for supper and the family loved it. thank you so much for the recipes!!!! You are so welcome Barbara, I appreciate you giving it a try and it just made my day to hear that y’all loved it! I made this for our Sunday dinner! It was easy and delicious…Thank you for sharing this great recipe. Thank you for giving it a try Rachel, I am so glad that it was a hit in your home!!! I made this Saturday night for supper . My Hubby and I really liked it My hubby said that it needed more sauce I agree. How could I add more of what ingredient? Another can of soup and 1/2 c milk? I think an additional can of soup and milk is the perfect addition for more yummy sauce! I may do that next time too! Thanks Christy!!! !❤ Can’t wait to try this. I am also looking forward to the leftovers, lol! I hope you enjoy it JoyMarie!!! I can’t wait to hear what you think!